Ever since the advent of home video, most kids develop certain favorite movies they watch again and again, much to the detriment of the mental stability of their parents. 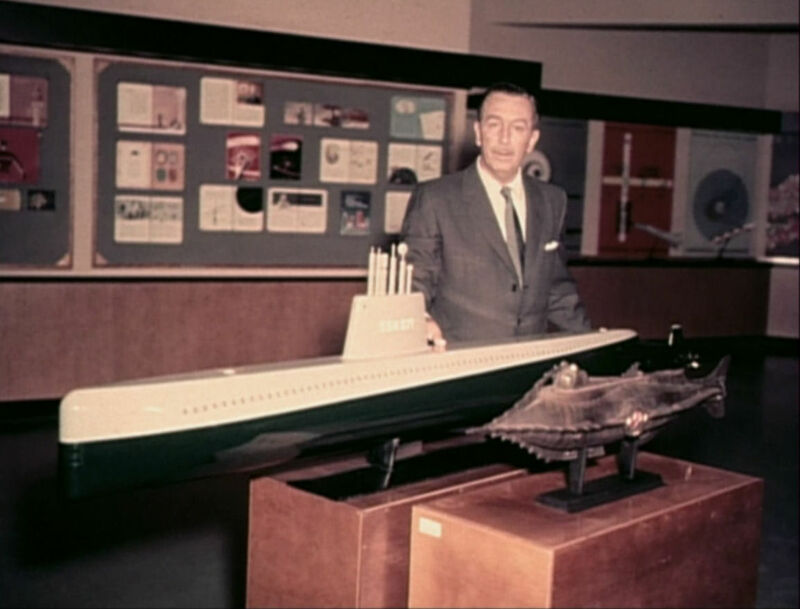 I can distinctly remember having a few, but one of them was Walt Disney's 20,000 Leagues Under the Sea. I was fascinated by the Nautilus and the undersea world, and I remember always being impatient to get to the giant squid sequence. Watching it as an adult for the purposes of this review was a surreal experience, as certain moments blew the cobwebs off of long-dormant memories. Until this past week, it had been about thirty years or more since I'd watched the movie, but it's clear that it had more than a passing influence on me during those years, even if I didn't consciously realize it. Therefore, no matter what I may think about 20,000 Leagues Under the Sea today, I will always cherish it and give it credit for sparking both awe and wonder in the young child I used to be. As an adaptation of Jules Verne's novel, its departures are significant. The entirety of the movie takes place in the Pacific, dropping the majority of the exotic locations visited in the novel and making the title a lot more dubious. Some scenes are shuffled around and repurposed, such as the island excursion with the savage natives or Nemo's brutal assault on a ship that goes down with all hands, while a handful of new scenes are thrown in, including an underwater trip in which Ned Land and Conseil attempt to recover lost treasure and a climactic assault by enemy forces on Nemo's hidden base. Nemo also has a pet seal now. All of this was done at the script stage because Verne's novel is incredibly tricky to properly adapt. When Richard Fleischer was hired to direct the film, he brought with him his friend and frequent collaborator, Earl Felton, to write a brand new script, having already decided to scrap all the previous ones Walt Disney had commissioned. After Fleischer and Felton read the novel, they were dumbfounded by what they saw as a lack of plot and the lack of any concrete explanation for Nemo's character. Felton decided to shift the focus from being an educational adventure story to something more akin to a prison break narrative, and both men agreed that fleshing out Nemo with a new backstory and a proper motivation--while simultaneously keeping his character true to that of the novel--was essential. In the end, they managed to create a story that has more thematic weight than the novel, centering on the morality of technology (specifically nuclear power). The novel dealt with mankind's abuse of nature to a certain extent--there is a scene involving a whaling vessel and a pod of sperm whales in which Nemo makes clear his hatred of humanity's brutality--and the film pushes that idea into the fore by way of a climactic conflict which raises the possibility that the nations of the world are not yet morally prepared to wield the fruits of Nemo's labors. The film never explicitly states that nuclear power is involved--and of course the novel doesn't either, because no matter how seemingly clairvoyant Verne was, not even he could have predicted the wonder and terror of the atomic age--but it does heavily imply it, giving the film a familiar message that resonated quite strongly with the times and was, as we've seen before, a common theme in science-fiction throughout the 50's and 60's. This makes for--spoiler alert--a surprisingly nuanced ending that isn't particularly happy. Sure, the trio of heroes ultimately escapes, as is the inevitable conclusion of a typical prison break story, but Nemo apparently dies, his island base is destroyed in a massive explosion, and the Nautilus is sunk, taking her entire crew with her to the bottom of the ocean. A lot of people seem to have this mistaken impression that Disney movies are all family-friendly sunshine and roses, but really, this kind of an uncomfortable ending is more in line with Disney's storytelling ethos, both then and now. That's because Disney movies, including this one, are more interested in telling stories that are true to themselves than in stories that give you a happy ending for its own sake. Felton and Fleischer did a great job with Nemo. The film version is true to Verne's iconic character: he's moody, prickly, and misanthropic, but also incredibly intelligent, stubborn with his off-kilter moral compass, and deeply haunted. He now has a clear backstory in which we learn his family was tortured to death and he was sold into slavery because he wouldn't give up his scientific knowledge, and that makes his actions believable and understandable, even though this version of Nemo's story doesn't entirely mesh with the background for Nemo that Verne originally envisioned. (Verne had two different backstories for Nemo, one involving him being a Polish exile at war with Russia--which he dropped from the book when editors complained about potentially harming Franco-Russian relations--and the other with him being an Indian prince, which is the version that became "canon" with The Mysterious Island.) Of course, when talking about Nemo, it is not just the writing that makes him such a great character on film; it is aslo James Mason, who plays him so well it is impossible to imagine any other actor in the role. 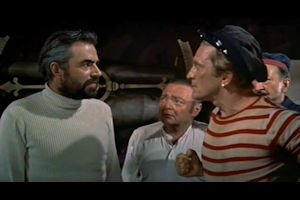 On the subject of the cast, Kirk Douglas is equally impressive as Ned Land, the hotheaded harpooner who is most anxious to escape the submarine. Land is an American Navy man in the film (as opposed to the Canadian fisherman he is in the novel), and Douglas plays him as both lovable and caustic. Land can be rude, pig-headed, arrogant, and obnoxious, but he can also be warm, friendly, and enthusiastic, not to mention the singing and dancing (for Douglas, this was the hardest part of the role, but he didn't hesitate to learn the guitar, sing, and choreograph his own movements for the film). Land is a more well-rounded character in the film, and as such, Douglas is the perfect counterbalance to James Mason, with the pair giving the movie its strong sense of character. Of course, Peter Lorre deserves a lot of credit, too. His casting against type as Conseil was a stroke of genius (Lorre jokes that his more typical role had already been filled by a giant squid), and it is Lorre who is often credited with keeping the cast and crew thoroughly entertained even on the hardest days of shooting. Though the film does far more right than wrong, a few things are lost in translation. Most critically is Verne's sense of science popularization, which is the best thing the novel has going for it. The science is toned down significantly in the film, and though one doesn't miss the tiresome recitations of taxanomical classification or the contrived Magic School Bus sequences I discussed in my previous article, it feels like the film fails to do the main thing Verne achieved with his writing: inspire future scientists. Then again, I did mention that this film had a profound impact on me when I was but a single digit in age, and here I am, a superfan of science. I can't be sure the correlation is a causation, but I also can't dismiss the possibility that, though I can't see it with my adult vision, maybe Verne's love of science somehow bled through that well-worn VHS into my younger eyes. 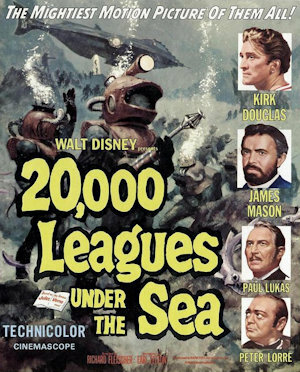 Before I go, let me just say there's a lot more to talk about when it comes to the film version of 20,000 Leagues Under the Sea. When I started researching the behind-the-scenes story of the movie, I was flabbergasted by some pretty incredible facts. Little did I realize that this fun little undersea adventure I loved as a kid was perhaps the biggest gamble of Walt Disney's career, a career filled with plenty of other enormous gambles that paid off thanks to his vision, his genius, and a lot of absurd luck. I decided to devote this article to talking about how the movie stacks up against the novel, but for the story I find even more fascinating--the story behind the making of this important film--I'm saving it for a video review that will be posted on my YouTube channel in a couple of weeks. You definitely don't want to miss out on that, so go on over to the channel and subscribe to get notified when it comes out, or better yet, become a Patron to see it even sooner.